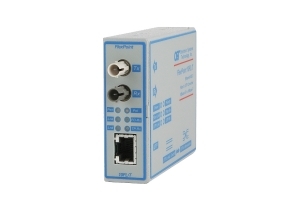 The FlexPoint 10FL/T is a 10BASE-T copper to 10BASE-FL fiber media converter that provides reliable and cost-effective network connectivity and fiber extension.The RJ-45 port auto-negotiates the duplex mode of the attached device for plug-and-play installations. The port detects and corrects wiring polarity reversals, and features a crossover switch that eliminates the need for a crossover cable and facilitates connectivity to network equipment such as hubs, switches and workstations. The FlexPoint 10FL/T is a 10BASE-T copper to 10BASE-FL fiber media converter that provides reliable and cost-effective network connectivity and fiber extension. The RJ-45 port auto-negotiates the duplex mode of the attached device for plug-and-play installations. The port detects and corrects wiring polarity reversals, and features a crossover switch that eliminates the need for a crossover cable and facilitates connectivity to network equipment such as hubs, switches and workstations. The fiber port operates at 850nm, 1310nm or 1550nm, and features ST or SC connectors. Multimode fiber models support distances of up to 5km, and single-mode fiber models support distances of up to 120km. The FlexPoint 10FL/T supports Link Propagate, which is a fault detection tool that provides a local indication of a remote link loss by disabling the port and propagating the loss of link from one port to the other. The FlexPoint 10FL/T features descriptions of the LED indicators on the label for easy in-the-field installation and maintenance. The LEDs report the availability of power, port activity and link status, speed and duplex modes. A pair of FlexPoint 10FL/T media converters are used to connect two 10BASE-T switches (A) via fiber. A workstation (B) and file server (C) are connected to the network using pairs of FlexPoint 10FL/T media converters. The converters are configured for Full-Duplex operation. In each case, multimode or single-mode fiber can be used, and fiber links can be extended up to 120km using single-mode fiber.